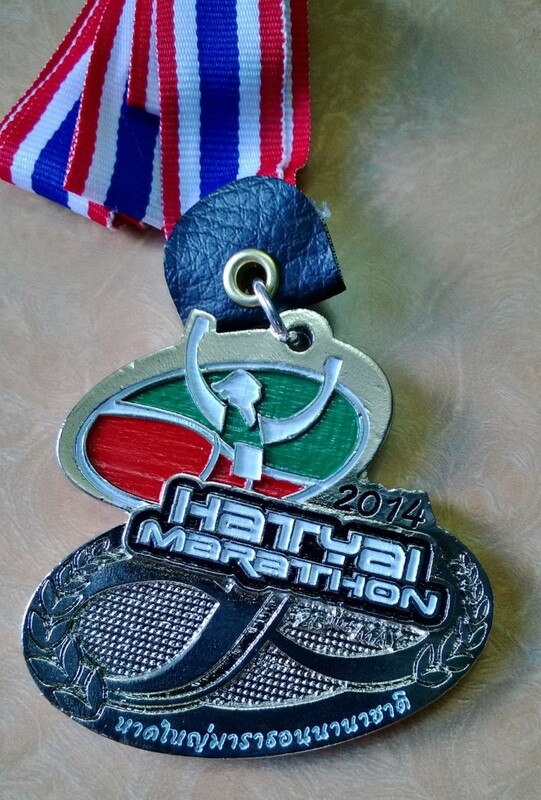 Race Review: 8th Hatyai International Marathon, 2014 (by 'ALCE') | JustRunLah! Although not a Finisher Tee but I am still happy wearing it. I was one of those unfortunate ones that booked the Starlight Ultra (21km) held in Penang in May 2014 but only to have the event postponed to August due to the by-election of Penang’s politician Karpal Singh. This has left me infuriated because my travel plans were all set and I was fully trained for this half marathon. I was frantically searching for an alternative overseas destination to run on the same date. It was then I had realized Thailand could be the answer. 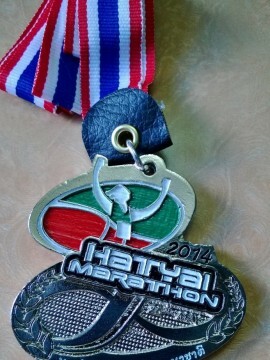 Alas, I found the 8th Hatyai International Marathon to be held on the same date! More on the event later. First off, travelling to Haytai has been made easy because there are comfortable coaches from Golden Mile Complex that brings you right to the doorstep (quite literally) of the race start point. If travelling long distances by coach is an issue to you, skip this option and book a flight. I decided to book a bus ticket on a Friday night, which will be due to reach Hatyai by Sat, 8am in the morning. After a good night sleep in the bus, I finally reached the Thailand immigration checkpoint at Sadao. Despite all the uncertainty and curfew conditions imposed in Thailand, the immigration counters were rather empty. Once I arrived at what is known as Hatyai’s central shopping district (another 1 hour drive from the checkpoint), I quickly went into the same bus company branch to book and secure a return trip back to Singapore on Sun night at 6pm. 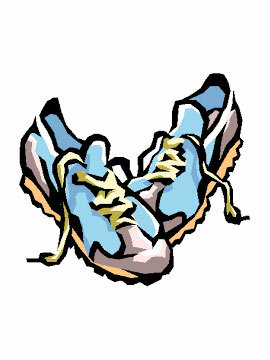 Don’t worry, there is plenty of time to rest and recuperate after your run on Sun. Trust me. After getting that squared away, I wasted no time and proceeded to the race expo to collect my race pack by means of a motorcycle taxi. The journey is very near and it will not cost you more than 100Baht (S$4). The race expo is held at Jiranakorn Stadium, Hatyai, Songkhla, right at the start point of the race (I know, how convenient is that right?). 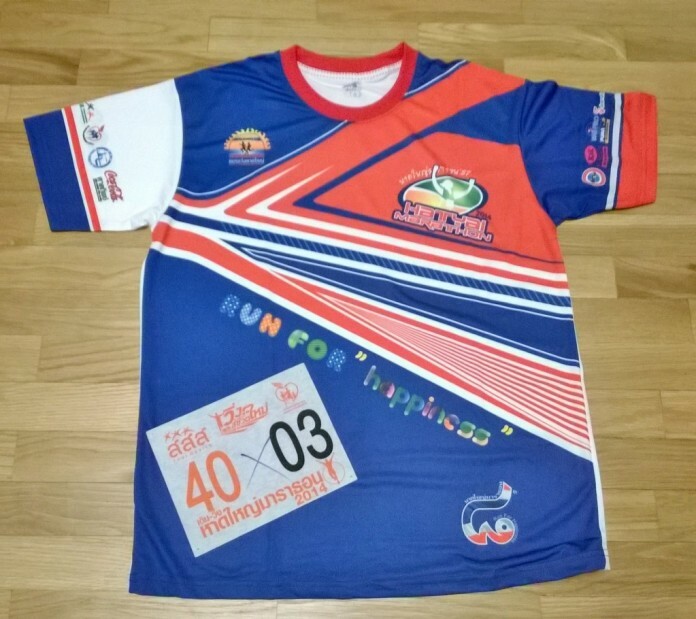 Ok, here comes the beautiful part of the race – for those who are unfamiliar, you can actually do a walk-in, register on-site and still get the right size of your event t-shirts/singlets at the race expo! You get to choose either a singlet or t-shirt. 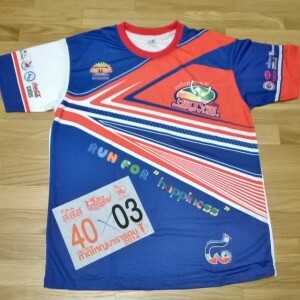 I chose the t-shirt since I will not be getting a Finisher Tee for 21km category. I had a quick look around the expo which most stalls sell lots of cheap sports attire and shoes, where most of it sold there I must say, were imitation of well-known brands. If you are looking for something that is meant for training (to take the harsh beating of your 70km per week mileage), this is not the place to purchase anything. Once happy and contented with my shopping, I headed straight to my hotel. It was a 6 mins motorcycle taxi ride that cost 40Baht (S$1.60) to be exact. I stayed in Greenview Hotel (700Baht/S$28 a night), which is like 1km away from the start point. Room was simple, very basic and within walking distance to night markets. Offers free and strong signal to WiFi. At 5pm, I was again heading back to the Stadium for the carbo loading ‘party’ sponsored by the organizer. Food was delicious and it mainly consisted of rice, chicken and vegetables. Heading back to town, I shopped and shopped until 9pm. Tiring as it may seem, I just wanted to proceed back to the hotel to just chill and have an early night before race day. I woke up at 3.30am on Sunday to have some pre-race snacks and a banana. Feeling excited, I walked to the Stadium where the start point is. All the runners were ushered to the start pen from the stadium which was led by a brass band. The full marathon is already in full swing while my half marathon race will be starting at 5.30am. The route is very flat and no unwanted surprises. The half marathon is a simple “out and back” type of running route with occasional supporters staring at you with a warm smile. You will have to run from the within the city out to the highway, do a U-turn at the 11km mark and back. But do take heed, there are no distance markers along the route at all. So as with all my overseas run (others being Gold Coast Airport Marathon and Las Vegas Rock ‘n’ Roll Marathon), my best advice is to wear some kind of GPS/distance tracking device. Running route was bestowed with drink stations about every 2km, serving cold drinking water, drinks that came in red, yellow and green colors, with light refreshments like watermelons and jellies. Overall, the route was scenic and safe. Thai traffic police were alert, enthusiastic and always cheering the runners on! Crossing the finishing line was such a joy! Volunteers gave out medals and certificate of completion at the end point. Moving further into the stadium, food and drinks were being served. I gave my Thailand chicken yellow rice away to a homeless man who came to me asking for food. Took another bike taxi back to hotel, had a well deserved shower and managed to catch a quick nap before checking out at 12pm. After a nice lunch, I remembered during my run that I promised myself to get a foot massage before I left just to pamper my legs. So I actually asked for a 2 hours foot massage (500Baht/S$20) and inevitably, I went into slumber land again…….. Altogether, I have spent only a S$270 (all expenses in) runcation. Not too bad huh? Boarded my bus at 6pm and it was home sweet home. Click here for more post from ALCE. wow, sounds like a great way to spend a weekend! i didn’t know we could travel to thailand from sg via coach! Hi smallsteph. Yes you can. And it really quite hassle free and comfortable. It cost only about $50 max (one way).